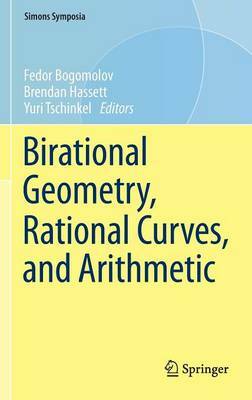 This book features recent developments in a rapidly growing area at the interface of higher-dimensional birational geometry and arithmetic geometry. It focuses on the geometry of spaces of rational curves, with an emphasis on applications to arithmetic questions. Classically, arithmetic is the study of rational or integral solutions of diophantine equations and geometry is the study of lines and conics. From the modern standpoint, arithmetic is the study of rational and integral points on algebraic varieties over nonclosed fields. A major insight of the 20th century was that arithmetic properties of an algebraic variety are tightly linked to the geometry of rational curves on the variety and how they vary in families. This collection of solicited survey and research papers is intended to serve as an introduction for graduate students and researchers interested in entering the field, and as a source of reference for experts working on related problems. Topics that will be addressed include: birational properties such as rationality, unirationality, and rational connectedness, existence of rational curves in prescribed homology classes, cones of rational curves on rationally connected and Calabi-Yau varieties, as well as related questions within the framework of the Minimal Model Program.